I have use this over and over again and hope it works to help the pain i have in my throat. I will keep using it to see if it helps me. 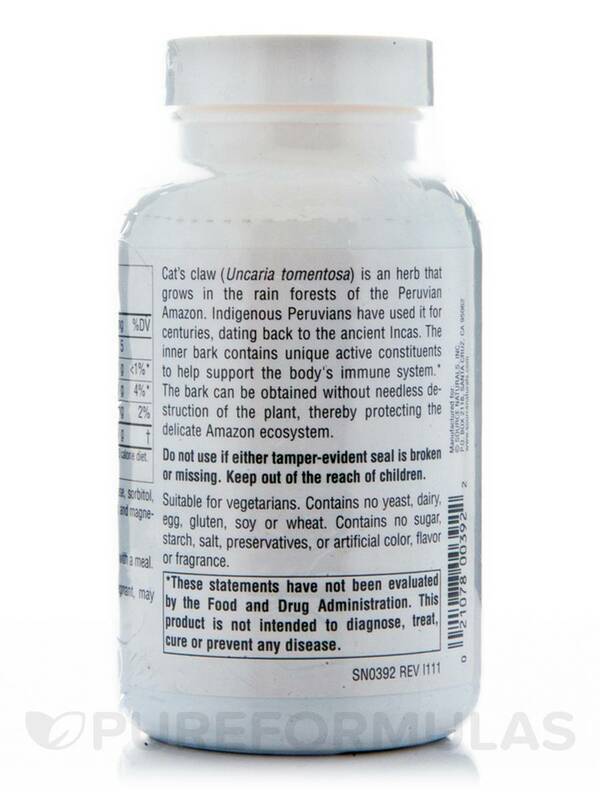 The Cat's Claw 1000 mg 120 Tablets from Source Naturals may benefit people suffering from rheumatoid arthritis and osteoarthritis. The Cat’s Claw‚ Uncaria tomentosa‚ is a plant that has been widely used in Peruvian medicine. For centuries‚ this plant has been used to treat digestive issues‚ arthritis‚ and wounds. Studies have shown that the oxindole alkaloids found in the bark and roots of the plant may stimulate the immune system‚ act as antioxidants to rid the body of free radicals and work to kill viruses‚ bacteria‚ and other microorganisms that cause disease. Laboratory analyses show that antioxidant power of Cat’s Claw may exceed that of many other fruit‚ vegetable‚ and plant extracts. Antioxidants play an important role in our body‚ by protecting the cells from damage caused by free radicals. 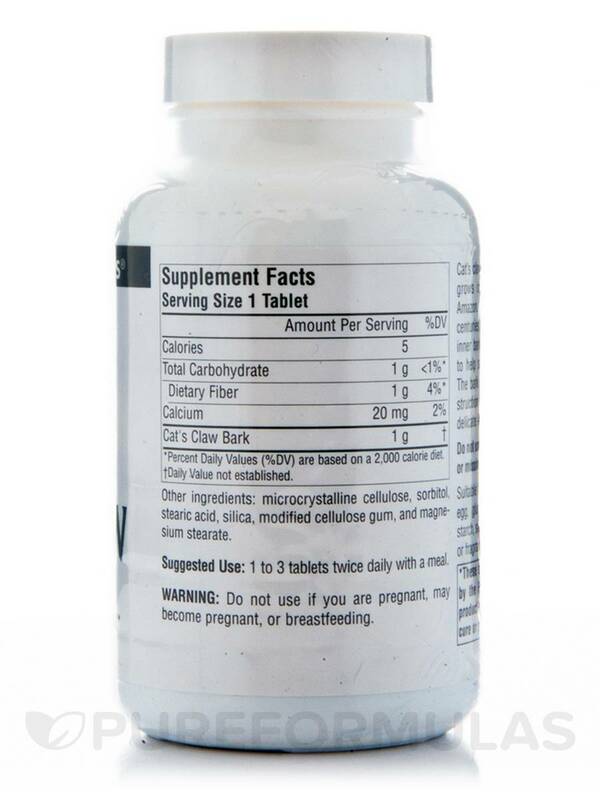 The free radicals are mutant cells that attack cell walls and DNA and eventually cause diseases. 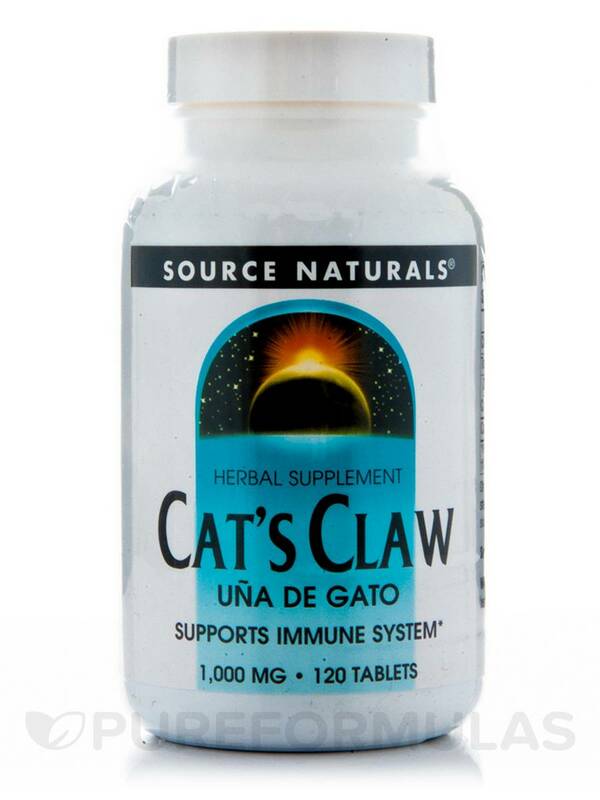 Cat's Claw 1000 mg 120 Tablets from Source Naturals has anti-inflammatory properties that may help relieve symptoms of arthritis‚ gout‚ and other inflammatory problems. Source Naturals obtains extracts from the inner bark‚ which contains active constituents that support the body’s immune system‚ without destroying the plant. The Cat's Claw 1000 mg 120 Tablets from Source Naturals is suitable for vegetarians and is free of yeast‚ dairy‚ egg‚ gluten‚ soy‚ wheat‚ sugar‚ starch‚ salt‚ preservatives‚ artificial color‚ flavor‚ or fragrance. Microcrystalline Cellulose‚ sorbitol‚ stearic acid‚ silica‚ modified cellulose gum‚ and magnesium stearate. Do not use if you are pregnant‚ may become pregnant‚ or breastfeeding.Do not use if either tamper-evident seal is broken or missing. Keep out of the reach of children.